Great Pillows and Great price!! 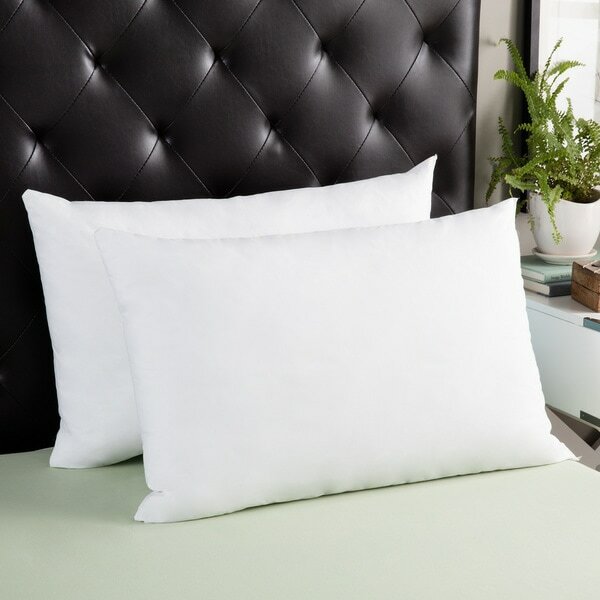 Lay your head down onto the cloudlike softness of these queen-sized Splendorest Angel pillows. With a soft cotton cover and plush down alternative polyester fill, the pillow is luxuriously comfortable. The medium density down alternative is fluffy and cloud-like but still firm enough to provide neck support, and the polyester fill is a great option for people with allergies. I won't buy any other pillows. I've bought 6 of these in the regular size and 2 in Queen size. Surprisingly the queen size were cheaper. The main reason I bought them in the first place was because they have the most fill of any other pillow I have been able to find but then after buying my first two and seeing just how wonderfully comfortable, fluffy and soft they were, I had to buy more. I have serious neck problems to the point where I have to get injections every few years and if I don't have the right pillows it can cause major issues so these are highly recommended if you want something that will be very soft, very comfortable but that will also support you while you sleep. Great very soft and flexible queen-size pillows. 100% covering as described. I was searching for a queen size bed pillows since most come in either standard or king size. There are very few places that offer Queen size bed pillows. I really wanted something very firm and these are far from it. They are very soft and my head sinks into them even though I have both of them stacked on top of one another. I am not sure that there were any firm or super firm pillows in queen size so this is why I say that they are just okay--if you like soft. Allergies prevent me from using down. These pillows are the best alternative I've found. perfect for front, side , or back sleepers. We both are side and back sleepers and they are perfect!!! Have tried others and they failed so support our necks and still be not hard as a rock. I would say they are med. firm but soft enough to hug and bounce back. Plan on buying more. Comfy pillows and great for the price. I do not like standard pillows on my queen bed because they don't fit right, so these are queen and they fit perfectly. Although I prefer foam pillows because of my allergies these are down alternative and good as long as they change the pillowcase every night. I use them for my gas and they love them. They are very comfortable and great for sleeping. They are nice and firm but not hard just right for keeping your head in a comfortable position and best of all they are machine washable. Those pillows are really soft but don't have much support. After reading product description and customer reviews I decided to try these pillows. This is my first time buying pillows online and not in person and they are fabulous! They do not require a breaking in period as others do. From the first night using them, these pillows were comfortable and helped provide a good night's sleep. I think I have found my dream pillow...these are heavenly....and I am so picky about pillows! You will love these. I would certainly recommend these pillows if you like very soft, squishable pillows. I found them very comfortable at first but my neck, unfortunately, didn't agree. I needed something more firm to support my neck while sleeping. We all prefer different types of pillows so, just saying, if you need neck support, this isn't your pillow. We really like these. They are soft and pliable, but don't squish flat when you put your head on them. Absolutely the best pillows I’ve ever bought. Comfy and cushioning. Good construction. Better than down, to me. No feathers to poke through. Love these - soft and comfy! I’ve been buying these pillows for 8 years. They are super soft but most importantly they stay cool through the night. They resemble feathers but they never stay flat and hard. As for duration I think they work for about 2-3 years before they clump up a bit. But at this price point I keep coming back to them as the quality and feel cannot be found elsewhere. These pillows are super comfy soft. I love them! I bought them to stuff shams with but I am thinking they may become my pillows to use everyday instead. Great value and a very hotel style pillow. Based on the customer reviews, it was the right pillow at the right price point for me.